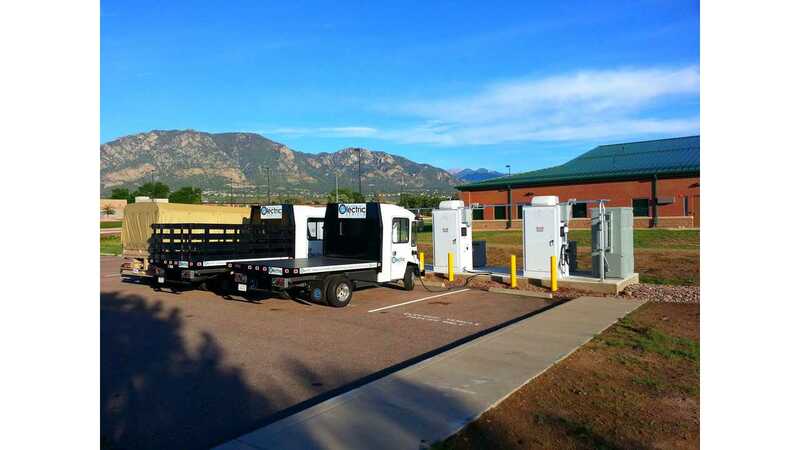 Burns & McDonnell Bi-directional EV Chargers at Fort Carson, Colorado feeding (or being fed by) electric trucks. Burns & McDonnell announced at the end of August that together with subcontractor Coritech Services, they've developed a system of bidirectional, fast-charging stations for a fleet of plug-in electric vehicles in Fort Carson, Colorado. "This first-of-its-kind system will push power back to the base microgrid when needed to meet installation demand or improve overall power quality." 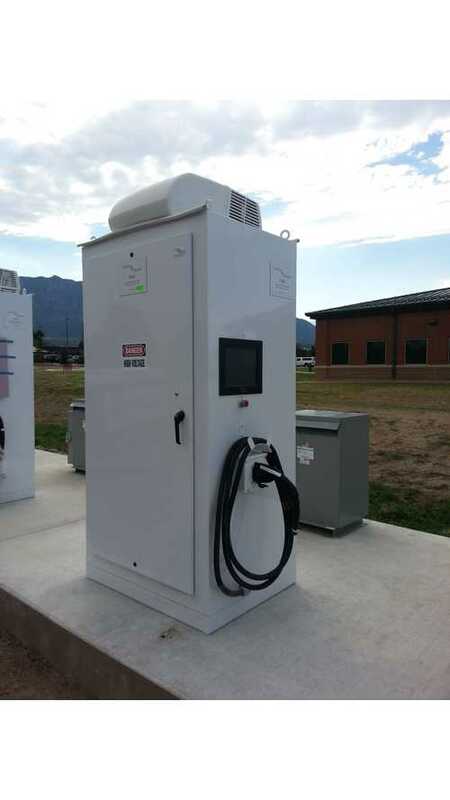 The system, consisting of five 60 kW bidirectional chargers and the necessary controllers, were successfully commissioned on 29 August as part of the Smart Power Infrastructure Demonstration for Energy Reliability and Security (SPIDERS) microgrid project at Fort Carson. The project is managed by the U.S. Army Corps of Engineers (USACE), Omaha District, and includes technical guidance from CERL and TARDEC. A performance test was conducted using electric trucks form Smith Electric Vehicles and Boulder Electric Vehicle. Noteworthy is that Boulder Electric, together with Coritech Services, introduced 60 kW V2G capability, so this station should be fully utilized with these trucks. Total charging and discharging power of the five chargers is as high as 300 kW and is done via SAE "J1772-compliant bidirectional charging cables," which likely means J1772 combo plug. "The vehicle-to-grid (V2G) charging includes power factor correction, which is a growing concern at locations such as Fort Carson that are experiencing a growth in on-site solar power generation, resulting in utility rate penalties." "The chargers are also integrated into the SPIDERS backup power microgrid, which allows the installation to utilize a fleet of bidirectional-capable electric vehicles as energy storage devices that, in conjunction with diesel generators and a 2-megawatt (MW) solar photovoltaic array, increases the reliability and efficiency of backup power systems to critical facilities at Fort Carson. The Burns & McDonnell team also includes Southwest Research Institute (SwRI) and Intelligent Power & Energy Research Corporation (IPERC) that provided design, programming and aggregation of the vehicle charging solution and microgrid integration."